The sequencing batch reactor (SBR) is a wastewater treatment option feasible for low flows. The objective of this research was to optimize SBR by varying its operational parameters, viz. (i) settling time and (ii) reaction time. The study was conducted in two phases. In Phase 1, raw wastewater was fed into the SBR after conventional settling, while in Phase 2 raw wastewater was fed into the SBR after coagulation-flocculation-sedimentation. A bench-scale model was set up and domestic wastewater was used for this study. Performance of the treatment system was evaluated through 5-day biochemical oxygen demand (BOD), chemical oxygen demand (COD) and total suspended solids (TSS). The results demonstrated that reaction time was reduced to 4 h in Phase 2 compared to 10 h in Phase 1. The BOD, COD and TSS removal efficiencies observed in Phase 1 were 80%, 80% and 73%, respectively, and for Phase 2 the removal efficiencies were 74%, 75% and 80% respectively. National Environmental Quality Standards (NEQS) were met in both cases and the treatment cost per cubic metre of wastewater for Phase 2 was 2.5 times lower compared to Phase 1. Water pollution is one of the major environmental issues faced by the world. Increasing levels of contaminants and pollution are affecting both humans and ecological systems (Jadhav and Mahajan, 2013). Developing countries are disposing huge amounts of domestic and industrial wastewater into streams and rivers, without any proper treatment. Poor management and weak implementation of environmental legislation is making these conditions worse (Ejaz et al., 2011). Various treatment technologies are employed to treat wastewater, sequencing batch reactors (SBR) being one of these. SBR has been in use for wastewater treatment since the 1920s. It has proven to be successful in treating wastewater from different origins, particularly for low or varying flow patterns. Municipalities, resorts, and a number of industries, including dairy, pulp and paper, tanneries, petrochemical, landfill leachate and textiles are using SBR as a wastewater treatment alternative (Al-Rekabi et al., 2007; Chakraborty et al., 2015; Mahvi, 2008; Yeruva et al., 2015). SBRs are operated in a batch mode to achieve the desired amount of treatment. Mixed liquor can settle, and clear supernatant is taken as treated wastewater. The SBR cycle consists of 5 phase that include fill, react, settle, draw and idle. One of the greatest advantage of SBR is its flexibility in operation that can be adjusted in terms of labour and energy requirements and, more particularly, in sludge production. Therefore, the treatment cycle may be adjusted to achieve the desired treatment (Al-Rekabi et al., 2007; Yoo et al., 2006). SBR has been used in various bench-scale studies; for example, one study focused on using SBR for the treatment of grey-water. The volume of the reactor was 18 L and the SBR unit was operated for 4 cycle times that included 5, 6, 7 and 8 h. Maximum BOD removal efficiency of 95% was observed at 7 h cycle time (Main and Ingavale, 2012). In another study, SBR was used to treat municipal wastewater. The removal efficiency in terms of BOD, TSS and nitrogen was 98%, 90% and 89%, respectively, considering a cycle time of 12 h (Umble and Ketchum, 1997). SBR was also successful in treating wood dyeing effluents, with COD and BOD removals of 85% and 95%, respectively (Penha et al., 2005). In all of the above studies, raw wastewater was fed to the SBR, which is typically referred to as conventional SBR. Some studies have been undertaken by modifying the conventional SBR; for example, a plastic media was used at the bottom of the SBR reactor for the treatment of dairy industry wastewater. The total cycle time used was 24 h (19 h for aeration/reaction phase, 3 h for settling phase and 2 h for fill phase). The removal efficiencies for COD and BOD increased by 5-7% with the aforementioned modification compared to conventional SBR (Sirianuntapiboon et al., 2005). In another study an improvement in treatment efficiency of SBR was observed for textile wastewater by combining biological treatment and adsorption using a low-cost absorbent, for example, a metal hydroxide sludge from the electroplating industry. This modification increased the BOD removal efficiency by 10% when compared with the removal efficiency of conventional SBR. In addition, a cycle time of 12 h was used in the modified SBR compared to 24 h in conventional SBR (Santos and Boaventura, 2015). Apart from biological wastewater treatment, another enhanced pollutant removal process exists, particularly at the primary level of wastewater treatment, termed chemically enhanced primary treatment (CEPT). Usually, metal salts or polymers are used in CEPT(Haydar and Aziz, 2009a; Haydar and Aziz, 2009b; Haydar and Aziz, 2009c; Johnson et al., 2008; Mahmoud, 2009; Mikelonis. 2008; Sarparastzadeh et al., 2007; Song et al., 2004). Some researchers have employed CEPT prior to SBR for treating wastewater. This was a continuation of applying various modifications to conventional SBR in order to enhance the knowledge related to SBR treatment and removal efficiency. One such study includes municipal wastewater treatment using poly-aluminium chloride and coagulant followed by SBR. The removal efficiency achieved for BOD, COD and TSS were above 90% with a cycle time of 12 h (Lin and Cheng, 2001). In view of the foregoing, it may be concluded that among various modifications studied, a CEPT-SBR combination gave the most encouraging results with respect to removals. In addition, a reduced cycle time was observed in some studies using modification, which can significantly affect the cost of treatment. However, these studies focused on SBR treatment by considering either the total cycle time or using some modification, but none considered optimization by identifying the separate effects of reaction and settling time on removal efficiency. These two parameters significantly affect the treatment efficiency and concomitant cost of treatment. Therefore, the present research was undertaken to fill this gap for conventional and modified SBR, known as the CEPT-SBR system. The reaction and settling time were varied with and without CEPT to arrive at the best arrangement, which provides better removal efficiency and at the same time is cost effective. Main Outfall is the largest wastewater disposal point in Lahore. It discharges about 518 400 m3/day of wastewater into Ravi River (Haider and Ali, 2016). Grab wastewater samples were collected on a bi-weekly basis from Main Outfall from July to September, 2014. Ten (10) samples were collected. The collected samples were transported in 20 L containers to the Institute of Environmental Engineering and Research (IEER) within 40 min. These were preserved according to procedure 1060(C) (AWWA. 2012). 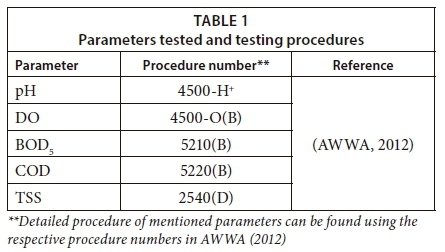 Wastewater was characterized by conducting the tests and procedures listed in Table 1. Each parameter was tested for the raw wastewater as collected and aftera plain sedimentation (settling) of 45 min. Thus the words 'raw' and 'settled' are prefixed with the parameter name to indicate this arrangement. Tests on raw wastewater was conducted for the purpose of characterization and to determine the removal efficiency of the SBR system. In addition, tests on settled wastewater were done merely to evaluate the effect of plain settling on various wastewater quality parameters. Two coagulants, aluminium sulfate (alum) and ferric chloride (FeCl3) were examined. The jar test was used to find the suitable coagulant and its optimum dose. The pH of wastewater after applying coagulant and sludge production were the two important considerations in selecting the coagulant. Alum's working pH range is between 4 and 8 and that of ferric chloride is between 3.5 and 6.5 and above 8.5 (McGhee and Steel, 1991). As indicated in Table 2, the pH of the raw wastewater was measured to indicate the need for pH adjustment for the coagulants. In addition, sludge production at optimum dose was measured using Imhoff cone. Media preparation: Sample of nutrient broth was taken and a 100 mL solution was prepared as per instruction. Autoclave: The sample was autoclaved for 20 min at 121°C for complete sterilization. Inoculation: After sterilization, bacteria were introduced from a test tube to the flask having nutrient broth, using rod and burner. After inoculation, samples were taken to a shaker for 24 h at 37°C. A fixed quantity of this culture (15 mL) was administered in the SBR, which helped in maintaining a constant F/M ratio. 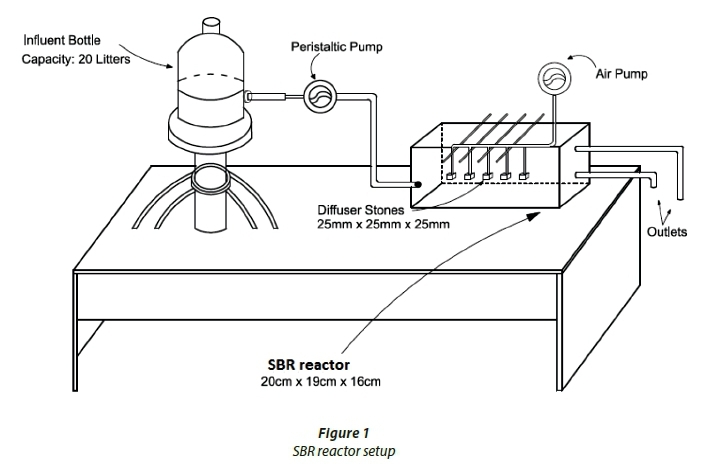 The SBR reactor was setup in the IEER lab using an acrylic sheet (Fig. 1). The dimensions were 20 cm x 19 cm x 16 cm, with a total volume of 6 L. Wastewater was fed to the reactor using an influent bottle and a peristaltic pump. The treated wastewater was collected from two outlets, one at 5.5 cm and the other at 10.5 cm from the bottom of the reactor. The reason for providing two outlets was to check the quality of water at different depths and thus make the results more reliable. The working volume in this study was in the range of 3-5 L. Air was supplied through an assembly of plastic tubes, diffuser stones and air pumps. The air supplied was sufficient to meet the oxygen requirements and to keep the solids portion suspended in the reactor. Efficiency of the SBR was checked with and without CEPT. The details are given in the following sections. Raw wastewater was fed to the SBR reactor using a peristaltic pump. Once the reactor was filled up, prepared isolated bacteria cultures (15 mL) were added to the SBR. Four different reaction times - 2, 4, 6 and 10 h - were used to study the effect of aeration on the SBR removal efficiency. After a specified reaction time, the air pumps were turned off and wastewater was allowed to settle. Hence settling time was also varied, for 2, 4, 6 and 12 h, for each reaction time. A total number of 16 experiments were performed to study the performance of SBR in order to select the optimum combination. The BOD, COD and TSS were determined for the treated effluent under optimum conditions and compared with National Environmental Quality Standards (NEQS) (Government of Pakistan, 2000). Figure 2 shows the arrangement of the SBR treatment without CEPT. SBR operation was also studied with wastewater pre-treated with CEPT. 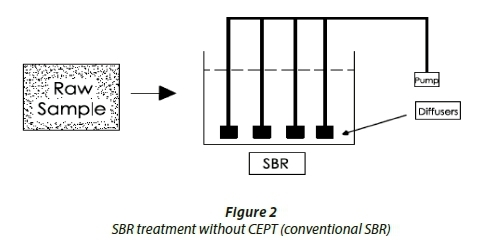 Figure 3 shows the arrangement of CEPT-SBR system treatment. Both reaction and settling time were varied as per the procedure outliner earlier (conventional SBR). The BOD, COD and TSS were determined for the treated effluent under optimum conditions and compared with NEQS (Government of Pakistan, 2000). Removal efficiency for both systems was calculated by comparing the raw wastewater and treated effluent concentrations. Operational cost was also evaluated for conventional SBR and CEPT-SBR system. The optimum conditions were used to calculate the costs, which included the electricity cost used to treat one cubic metre of wastewater using two air pumps (each pump had a power requirement of 63 W) and the cost of coagulant. An electricity tariff of 0.15 USD/kWh was used (LESCO, 2014). The coagulant costs were 19.63 USD/kg for alum and 21.65 USD/kg for ferric chloride. 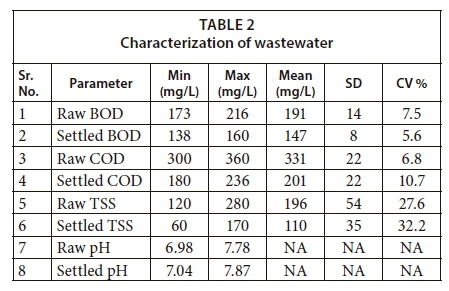 Wastewater characterization results are shown in Table 2. Raw BOD for wastewater samples varied between 173 and 216 mg/L, with a mean value of 191 mg/L. The average values for raw TSS and COD were 196 and 331 mg/L, respectively. There was high variation in TSS, with the coefficient of variation (CV) for TSS being the highest for all parameters. The pH also remained in a range that is suitable for biological treatment. Figures 4 to 6 show the change in effluent condition with respect to BOD, COD and TSS, respectively, by varying reaction and settling time. It can be deduced that the removal efficiency increased by increasing reaction and settling time for BOD and COD; however, in the case of TSS this trend changed slightly. Considering settling time up to 6 h, the effluent concentrations of BOD, COD and TSS kept decreasing with an increase in settling time. Beyond 6 h, there was no significant decrease observed. Thus, 6 h was adopted as the optimum settling time. The optimum reaction times were observed under the selected optimum settling time. 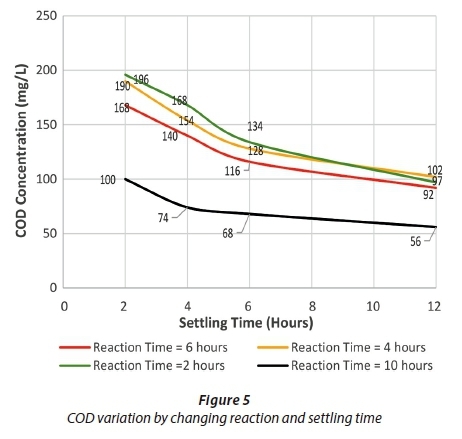 The highest removal efficiency range was observed with 10 h reaction time for BOD and COD. Hence, this was selected as the optimum reaction time. 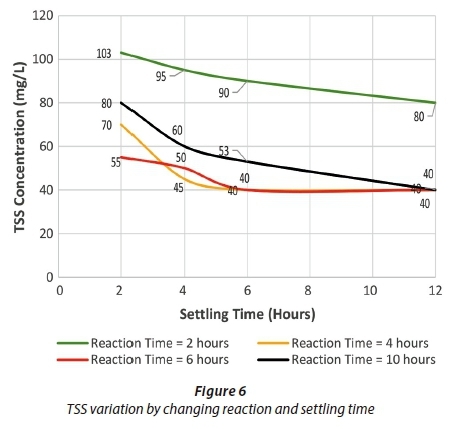 For TSS removal, both 4 h and 6 h reaction times appeared to be suitable in terms of removal efficiency. However, it is not practical to adopt a dual reaction time in one reactor, for example one for BOD and COD and one for TSS. Therefore, for practical purposes the optimum reaction time (10 h) initially selected for BOD and COD was taken as the design reaction time for conventional SBR. NEQS were met for BOD, COD and TSS under optimum conditions. Table 3 shows the removal efficiencies and effluent concentrations of BOD, COD and TSS for conventional SBR under optimum conditions. 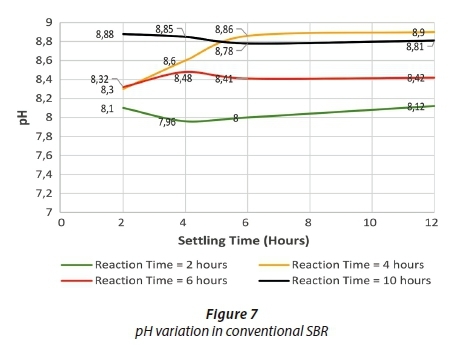 Figure 7 shows a slight variation in pH with increase in reaction time and settling time when compared with raw wastewater condition. The jar test results are shown in Fig. 8. The optimum doses for alum and ferric chloride were 74mg/L and 50 mg/L, respectively, and sludge production was 10 mL/L and 45 mL/L, respectively. Ferric chloride was found to have more rapid sludge settling compared with alum. In addition, ferric chloride produced several times more sludge than alum (Davis, 2010; Yonge, 2012). The working of a coagulant is also dependent on pH, which can be a major reason for this significant difference in sludge production (Koohestanian et al., 2008). In case of alum, no pH adjustment was required as the wastewater pH was in the working range of the coagulant. However, for ferric chloride pH was adjusted to 11.2. Based on the results, alum appears to be a suitable coagulant for the following reasons. Alum produces less sludge hence less sludge handling costs. Ferric chloride imparted colour to wastewater. Alum showed results within a pH range that is suitable for biological treatment. However, ferric chloride needs pH adjustment at multiple stages. For example, pH adjustment of wastewater is required before applying this coagulant to make it work in CEPT. Similarly, after applying CEPT pH must again be adjusted to enable biological treatment. Hence, the use of ferric chloride would be costly. Figures 9 to 11 indicate the effluent condition of BOD, COD and TSS, respectively, for the CEPT-SBR system. The removal efficiency increases by increasing reaction and settling time for BOD and COD. The effluent concentrations of BOD, COD and TSS kept on decreasing with an increase in settling time up to 6 h; thereafter, no significant removal occurred. Thus 6 hours was adopted as the optimum settling time. Considering the optimum settling time, a suitable reaction time was selected. 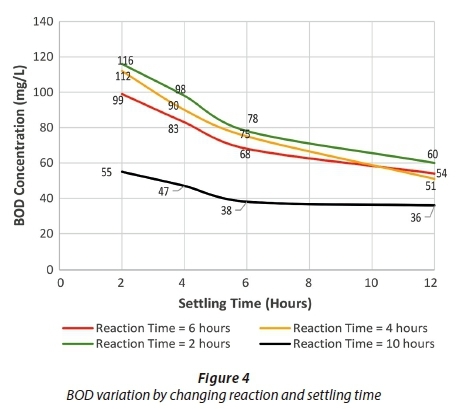 The removal efficiencies achieved at 4 h and 6 h reaction times were approximately equal for BOD and COD. In addition, these removal efficiencies were almost the same when compared to conventional SBR removal efficiencies under selected optimum conditions. 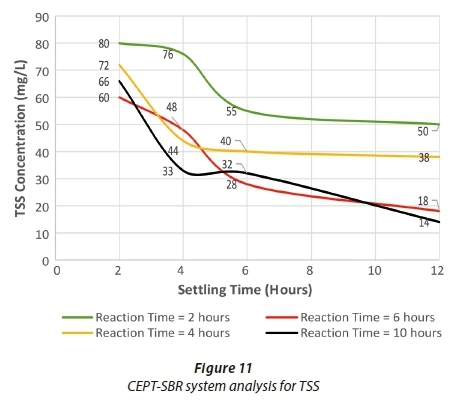 For TSS, both 6 h and 10 h reaction times gave the maximum removal efficiency for the CEPT-SBR system. However, the 4 h reaction time still gave the higher removal efficiency compared to that achieved in conventional SBR under optimum conditions. Therefore, as it is not practical to adopt a dual reaction time, a reaction time of 4 h was selected among all feasible options for the CEPT-SBR system. NEQS were met for all the parameters in CEPT-SBR system under optimum conditions. Table 4 shows the removal efficiencies and effluent concentrations of BOD, COD and TSS under the selected optimum conditions for the CEPT-SBR system. 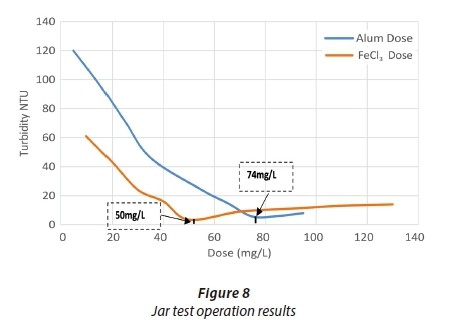 Figure 12 shows that the pH dropped in the CEPT-SBR system, due to the addition of alum during jar test operation (Barkoh et al., 2013). However, the observed change was not that significant. The pH during the conventional SBR process remained between 8.1 and 8.9, whereas after applying CEPT the pH dropped to 7-7.82. For conventional SBR, a reaction time of 10 h and settling time of 6 h were selected as optimal. However, in the CEPT-SBR system a reaction time of 4 h and settling time of 6 h gave the best results. A comparison of removal efficiencies under optimum conditions for both systems is shown in Fig. 13. 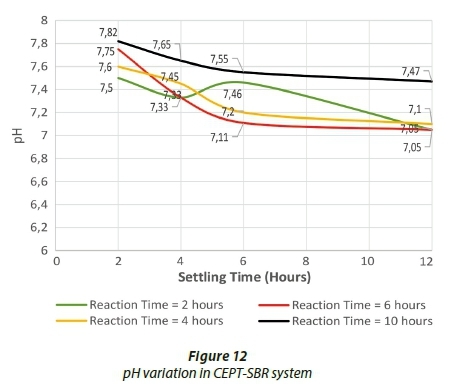 Figure 13 shows that removal efficiencies of both systems were comparable, considering the 10 h reaction time of conventional SBR and 4 h reaction time of the CEPT-SBR system. The BOD and COD removal efficiencies were 5-6% higher in conventional SBR compared to the CEPT-SBR system. 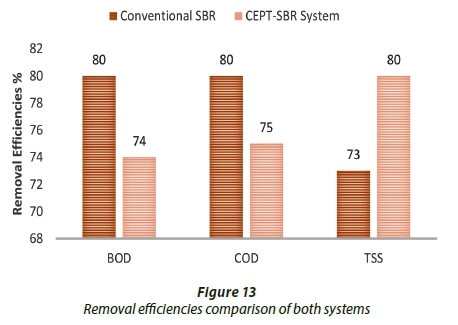 However, the CEPT-SBR system gave 7% better removal efficiency for TSS. The comparison of effluent condition, under optimum conditions, for conventional SBR and CEPT-SBR system is shown in Fig. 14. 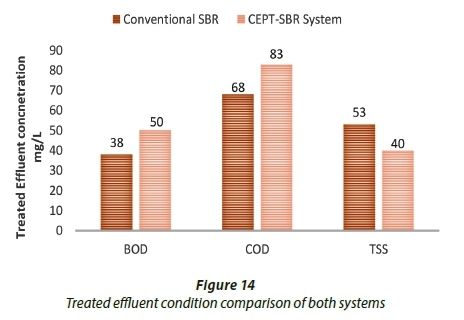 Figure 14 shows that effluent concentration from conventional SBR was slightly lower when compared with CEPT-SBR system for BOD and COD. However, lower TSS concentrations were achieved in CEPT-SBR system. 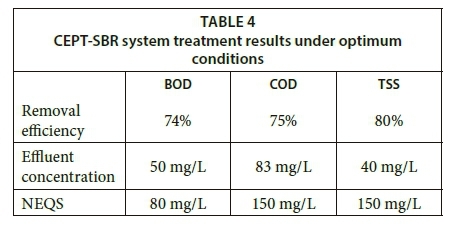 The cost comparison for treating 1 cubic metre of wastewater using conventional SBR and CEPT-SBR system under optimum conditions is shown in Fig. 15. 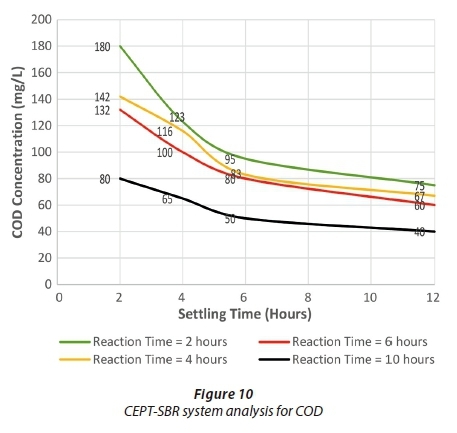 Figure 15 shows that cost per cubic metre of wastewater for conventional SBR was approximately 2.5 times greater in comparison to CEPT-SBR system under optimum conditions. 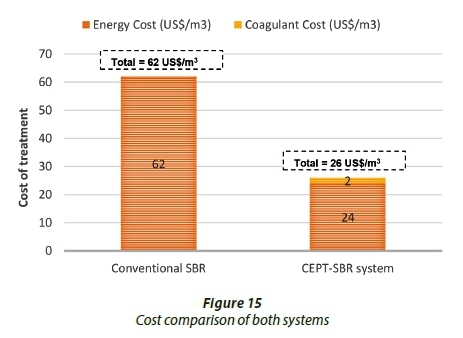 Only energy costs are entailed in conventional SBR, whereas in CEPT-SBR system there is an additional cost of coagulant along with the energy cost. However, the total cost of the CEPT-SBR system was lower, due to the reduction in reaction time, which made the CEPT-SBR system a better option. In conventional SBR, the optimum reaction and settling time were 10 h and 6 h, respectively. The BOD, COD and TSS removal under optimum conditions ranged between 73 and 80%. The effluent concentration for BOD, COD and TSS were 38 mg/L, 68 mg/L and 53 mg/L, respectively. Alum was a better choice for CEPT-SBR system treatment with an optimum dose of 74 mg/L. It also produced less sludge (10 mL/L against 45 mL/L for ferric chloride). In the CEPT-SBR system, the optimum reaction and settling times determined were 4 h and 6 h, respectively. BOD, COD and TSS removal under optimum conditions ranged between 74 and 80%. The effluent concentrations for BOD, COD and TSS were 50 mg/L, 83 mg/L and 40 mg/L, respectively. 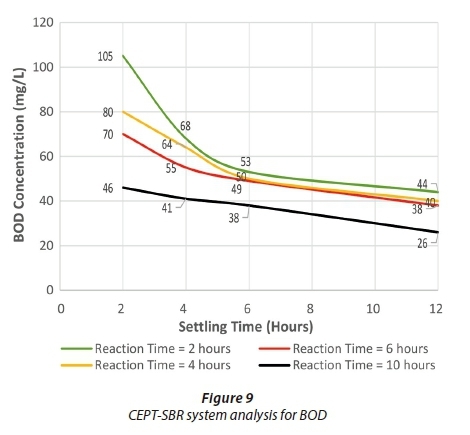 Comparing both systems, the optimum reaction time in CEPT-SBR system has been reduced to 4 h, compared to the 10 h reaction time of conventional SBR for all parameters. Cost comparison showed CEPT-SBR system to be a better choice.